We keep birthdays low-key, but Andrew needs a little extra celebrating this year. Over the next few days, I'll be sharing details from our ultimate LEGO birthday party. I've scoured the web and come up with a few ideas of my own. And of course, we'll be doing it on our signature small budget! Let's start with the invitations. LEGO City offers printable party invitations, but we found it cheaper (and more colorful) to develop our own. Andrew built his own LEGO birthday scene, and I took photos. We ordered prints from Sam's Club (8-cents each), then glued one to the top of each card. As our gift to you, click on the high-res photo at top and save it to your computer. Print and use with our permission for a happy LEGO birthday! Click here for the complete series of posts on planning the ultimate LEGO birthday party, including cake, decorations, and activities on a budget! sweet of you to give such a useful gift! thank you!!! i have a soon to be severn year old son that would love me to pay attention to these next posts. Cute idea!! My 6 and 5 years olds would love a lego birthday party I am sure. Great ideas! I'm sure you already have cake ideas, but in case you haven't seen this one yet, I made a lego cake for my husband last year. It links to the recipe. Oooh--awesome idea, Meredith! How do you find the time to do all this GREAT stuff? Wonderful job! I can't wait to see the rest of the plans! Very fun! And so sweet of you to acknowledge that he needs a little extra celebrating this year. It's not easy being the oldest. Can't wait to see the rest of the plans! Cute idea for an invitation...my ds happened to be my side when I was reading your post and he, a Lego fan, thought it was cool! We look forward to more details on the theme. Do you pay for parties from your hospitality envelope, or do you have a separate budget for birthdays, Christmas, etc? Just curious! Cute idea! Hope he is well this year :)! My little girl is turning 5 next week and we are finally entering the lego age. :) The time between the end of childhood and your first child's introduction of legos is known as the "dark period" among lego fanatics like my dh. He is so excited. We also bought an adorable hand made lego topped table which should make it even more fun. We don't usually have friend parties but I love the photo invite. Such a great idea. Happy Early Birthday to Andrew! Those are just so cute...my son would love those..creative!!! I'll be following the plans carefully. ALl my boys love legos. Birthday parties (the kind with friends over and a theme) are an every other year thing at our house. And even that is a lot when you have 4 (soon to be 5) little ones. But I really love them. It's a nice time to collaborate with a child one on one and to teach hospitality. And to stretch my creativity a little. Can't wait to see what you and ANdrew come up with! Have you seen the Lego cakes? All you do is make a sheet cake and some cupcakes. Turn the cupcakes over onto the sheet cake in a Lego brick design and cover with your favorite Lego colored icing! Easy and cute! We did this with my son last year and it was a hit! Those are great! Way to be creative! 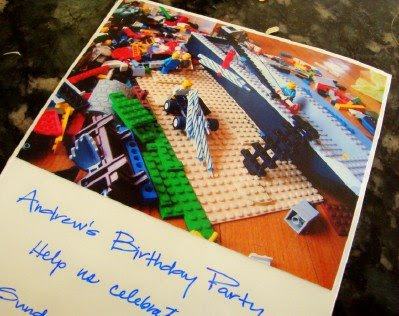 What a cool looking invitation -- Happy birthday Andrew! We had a few Lego parties through the years. Shhh...he still drags them out at 15! This is really cute! We keep birthday's low key around here too. Birthday's are so much fun when you are not creating a mini wedding out of them! I love that idea...it would work for just about any of your childs favorite toys...because we all know they have tons of their favorites...thanks for the great idea! That is a really great idea for invitations. you're such an awesome, creative mom! wow, thanks for the picture! We are doing a lego party for our son in July, so this will definitly help! Hope Andrew has a great time! You have such beautiful handwriting as well! My boys would be thrilled to get an invite like that! I made a lego cake (a loaf pan and a square pan with cupcakes inverted on top for 2 and 4 bump legos), had a lego building contest and put lego fruit snacks in the treat bags! Big hit! Come link up with the fun! you for their LEGO birthday party! Please RSVP by September 17 if you can join us! (Get it??? LINK, CONNECT, JOIN???) I was so proud! WONDERFUL and very creative, eye-catching idea, Meredith! Love it! While I am so sorry I did not get to talk to you more at Blissdom, I am SO glad I now know about you and your wonderful family, blog and blogging style. I love the fact that you are a very busy mom like me(of course I think mom = busy:)and have found such a great way to blog - brevity but great content, including links and images...love it! As for this birthday party, what a great idea!! I shall have to use that though in the future! So sorry that you have all been so sick...hope you can recover and stay well! Adorable! I love the banner - how ingenious! Kids don't know if parents spend 5 dollars on a party or 500! They just want to be with their friends having fun - and this certainly looked like a Lego Blast! Awesome! I am so glad you shared this idea and I look forward to reading more about it. My 10 yo and 8 yo sons are Lego nuts! WoW This is old but I am so happy that I found it! What a great idea! @ My son's 7th is coming up and he is addicted to all things lego! These invites are great. And thanks for the pic. Thanks for the inspiration and the image. 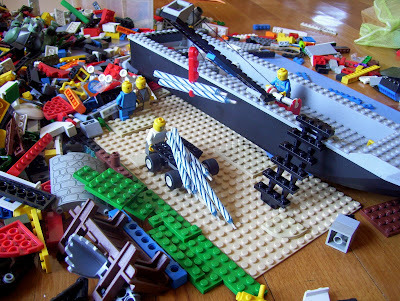 My son, Andrew, is 7 next week and a huge Lego fan. Maybe it is an "Andrew thing"!